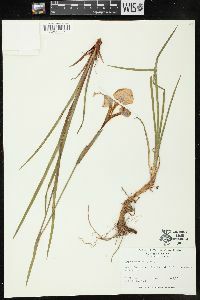 Rhizomes extensively branching, to 12 × 0.5-0.7 cm, becoming 1.5-2 cm diam., with coarse, strongly ribbed, brown, scalelike leaves. Stems simple or rarely 1-branched, 3-7 dm. Leaves: basal with blade green, often with red-brown margins, lightly ribbed, linear-ensiform, 3-5 dm × 1.5-2.3 cm, glaucous, apex acute; cauline 2-3, spreading, blade narrowly linear, 0.5-0.7 cm wide, apex acute. 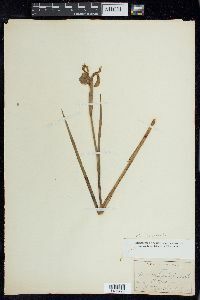 Inflorescence units 1-flowered, branch unit (if present) 1-flowered; spathes covering pedicel, ovary, floral tube, and base of sepals, unequal, outer 3 cm × 10 mm, inner 6 cm × 10 mm. Flowers: perianth blue-violet; floral tube with brown striations, funnelform, 2-2.5 cm; sepals blue-violet with deeper veins, with yellow-white signal, orbicular, 7-8 × 3-4 cm, base abruptly attenuate into whitish claw with yellow-brown veining; petals mostly hidden by bases of sepals, much reduced, 1.5 × 0.3-0.5 cm, bristle absent; ovary trigonal, with shallow groove at each angle, 1.5 cm; style 3.5-4 cm, crests linear to subquadrate, 1-1.8 cm, margins sometimes incised; stigmas semicircular, margins entire; pedicel 2-3.5 cm. Capsules globose to oblong, obtusely 3-angled, with rounded angles, 2.5-4 × 2 cm, rounded basally, abruptly contracted into beak apically. Seeds in 1 row per locule, dark red-brown, semicircular, flattened, 6-8 mm; seed coat thick. 2n = 40. Flowering May--Jun(--Oct). Rich, swampy, shaded places, usually along coastal plain; Ala., Fla., Ga., La., N.C., S.C., Tenn. Iris tridentata is quite different from the other two species of ser. Tripetalae that occur in the flora. 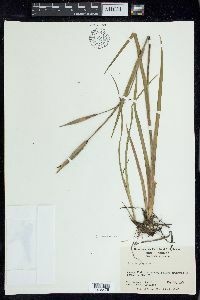 The rhizome has been described by W. R. Dykes (1913) as 'almost stoloniferous,' by J. K. Small (1933), 'the cord-like rootstocks are peculiar,' and by R. K. Godfrey and J. W. Wooton (1979), 'clothed with coarse, strongly many-ribbed, brown, overlapping scales.' The brown scalelike leaves are produced very close together and are long enough that they appear as a small fan; as the internodes elongate, the scales are pulled apart but still overlap along the rhizome. Roots are produced from the lower side of the rhizome at the nodes. Branches may appear at any node along the narrow portion of the rhizome rather than just from the broader apex.